› How are rune stones read? 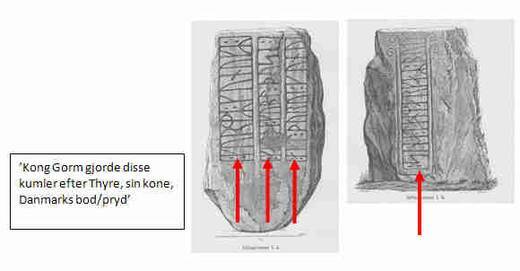 The inscriptions on the rune stones are, with one rare exception, not written in horizontal lines like in a book, but in vertical lines. The Danish rune stones of the Viking Age are generally written in three different ways, parallel order, bustrophedon (originates from Greek and means “like an ox turns when ploughing”) and contour order. The reader usually begins in the bottom left corner of the stone. 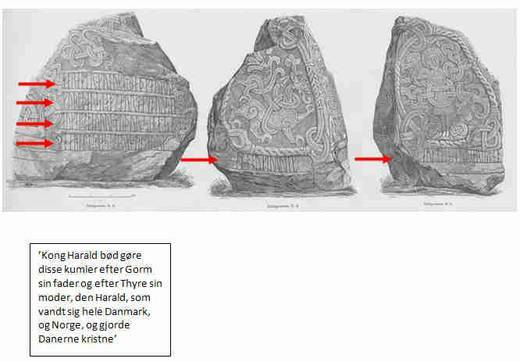 King Gorm’s rune stone, raised in honour of Queen Thyra, is an example of parallel order. The inscription is in vertical lines, which can be read one after another from the bottom up. The reader starts with the three lines on one of the stone’s broad sides and then reads the last line on the opposite side. The large rune stone erected by Harald Bluetooth in memory of his parents Gorm and Thyra is the only example which deviates from the common norms. Here the inscription is written in horizontal lines and is read from left to right, like the text of a book. It is clear that Harald was inspired by Latin manuscript art, which was widespread within the Church and courts of Christian Europe. It is possible that the king himself owned books containing text and colourful pictures.